Plan ahead! When you take pictures we can see more than just you. If you are going to take pictures make sure everything will look nice. The clutter in the corner of your bedroom or living is not aesthetically pleasing. A true lady would never live in a cluttered, disorganized mess. 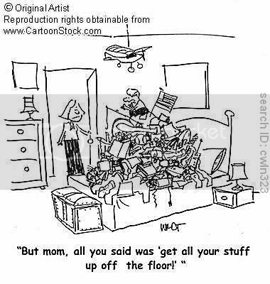 If one did live that way they would not tell or show everyone their cluttered house. You do not need to have a recently shampooed rug with lovely Victorian style furniture in the background. Simply pushing the mess out of the picture range will do. Or even better, put items back where they belong. Then you do not have to worry about clutter piles in your pictures. A cluttered house reflects badly on you. It makes others wonder how you take care of your lovely clothing. Then if you try to sell your clothes, buyers might be hesitant to purchase from you. Thank you! Your blog is wonderful as well. I like the topics you write about.